Ford has launched a new in-car noise-cancelling system that uses the same principles as noise-cancelling headphones. Called Active Noise Control, it uses three microphones strategically placed around the car interior to detect unwanted noises from the engine or gearbox. Then, like noise-cancelling headphones, it sends out opposing sound waves to counteract them. "Noise is intrusive and reduces the driver’s mental processing power, and can lead to distraction and stress," says Dr John Cartwright, chief medical officer, Ford of Britain. "By removing unwanted powertrain noise, Ford is helping customers to complete their journey calmly and in comfort." Cleverly, the system doesn't affect the volume of music from the stereo or conversation between passengers. That's because it records driver and vehicle behaviour to anticipate what will happen next, for example when the driver is accelerating in a lower gear. 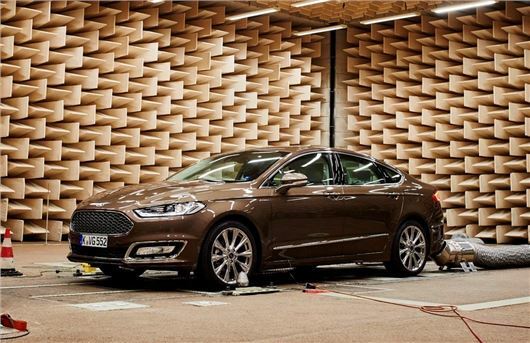 Active Noise Control will make its debut in the Ford Mondeo Vignale - Ford's upmarket version of the Mondeo which it hopes will rival premium manufacturers. It will be one of several sound-proofing measures in the Vignale including acoustic glass for the windscreen and front windows. The Vignale also uses foam rather than fibreglass for engine bay insulation along with extra sound proofing within the wheel arch liners, front and rear doors and underbody shields. Ford continues to work with Sony when it comes to ensuring a high quality audio system. As a result the Vignale has 12 high-quality speakers and a sophisticated digital signal processing amplifier. The Mondeo Vignale is built at Ford's state-of-the-art plant in Valencia, Spain. It's hand finished at Ford’s Vignale Centre, where vehicles are subjected to 100 additional tests.